Welcome back Vendetta Family, Taurus here. On this episode of VendettaSound, presented to you by the dynamic duo King x Taurus and sponsored by E.M.G, i’ll tell you about them in a little bit. This week was pretty turnt, heres why. Taurus brought us an excellent playlist for Valentines day, King brought some insane liveliness to the show with his well known Twitter topic segment. We spoke about the snake that ate 36 million in cash”… yeah I know right? Let’s not even talk to much about this episode’s Freestyle sesh, we’ll be bringing more heat after the reading week. We got party invitations going up again. It was a pretty “in the moment” episode, I hope you enjoyed it. Snake loots Vault of 36 Million??? We hopped on Twitter this weekend, and its buzzing about a Snake eating Money. We can not make this up. BBC Africa picked up on the buzz and did some digging. So some examination committee in our lovely country Nigeria, got robbed of 36 million. Clearly there’s something fishy going on in the education sector and a certain “someone” managed to embezzle 36! Three-Six! Thirty six million! And decided to troll us by blaming a snake. Just like I’m sure you had thought you heard it all, but I think this takes the cake. Clearly this thief doesn’t rate us. So as we all know Valentine’s day is around the corner, we talked about the most romantic gesture we’ve ever received, while playing some mood music from DJ Taurus’ VendettaValentine’sDay playlist, linked below. 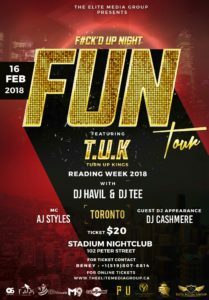 Start your reading week right, E.M.G presents another edition of F#CK*D UP NIGHT, the name already says it all, I mean it clearly doesn’t but you know what I mean. 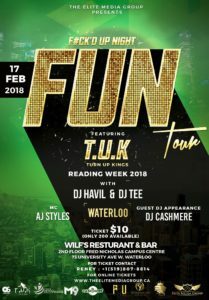 Come through to WILF’s this Saturday and turn up. Black History month has been awesome for our fellow people of Afro descent especially our stars who are doing it big this month. I’m sure quite a bit of you are stoked about the film Black Panther coming to cinemas, as am I. Interesting enough, Kendrick Lamar released an album in tandem with the movie as this is the track list for the film. That’s about it for this week’s blog. In conclusion this week was a good week overall…apart from the midterm stress, but we always have the listeners to hear us vent so we appreciate you greatly for being here for us. All in all we here at vendetta wish you a good week, happy valentines day and good luck on midterms. Have a great reading week, signing out…Its Taurus, till next time.